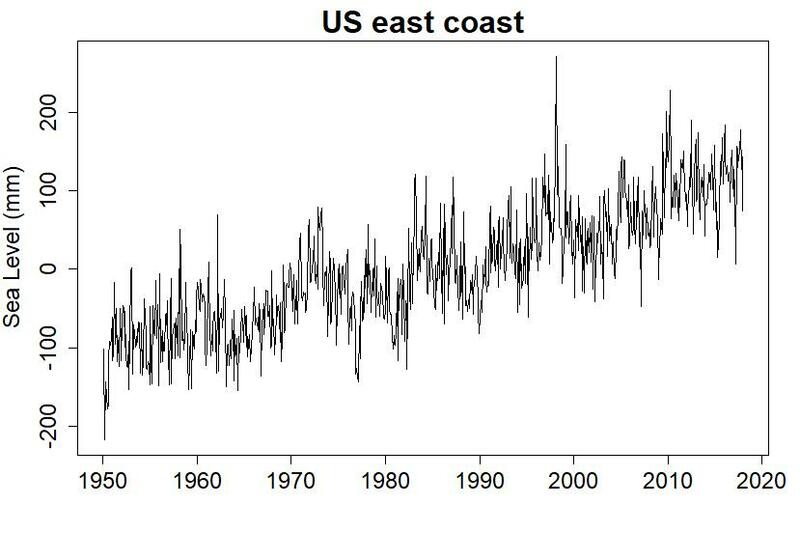 It was suggested that sea level along the U.S. east coast can be affected by the el Niño southern oscillation (ENSO, usually just referred to as el Niño although that’s not quite correct usage). And indeed it does. 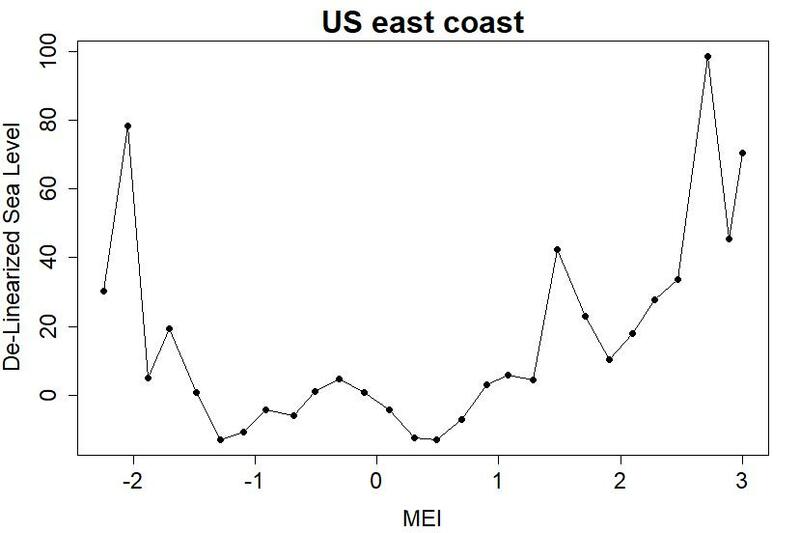 I looked for its fingerprint in the data for the U.S. east coast, aggregated by my new method. Hence using MEI to characterize el Niño, we can account for some of the notable sea level outburst in the last 70 years, but more remains unaccounted for. The math suggests that the rate of sea level rise increased by 1.7 +/- 0.8 mm/yr. Of course there’s more to do. I’d like to repeat this analysis for the four regions I’ve delineated, and I’ll note that the present analysis is dominated by behavior north of Cape Hatteras simply because there are more stations there. Smaller regions will probably tell an interesting story. I will also repeat that the 13-year periodicity due to polar motion bodes ill for the U.S. east coast, especially north of Cape Hatteras. This analysis suggests it could let loose the rising sea right around the year 2023, which might just be a monster for sea level problems on the Atlantic seaboard. fwiw, I keep up with meteos who know a lot more than I do, and saw recently something about downgrading the El Nino signal in the last day or two. Meanwhile, we are facing sudden stratospheric warming, which has finally occurred and bringing some cold blasts, including a potential new Beast from the East to Europe. How do you calculate the statistical significance of a trend change? I am looking at temperature data for Canberra, and there is a change in the mean that has a very high level of statistical significance. There is also a trend change. But I do not know the methodology for calculating its significance. [Response: The null hypothesis is a single trend at constant rate. So, fit a model beyond that and test whether you can reject the null. 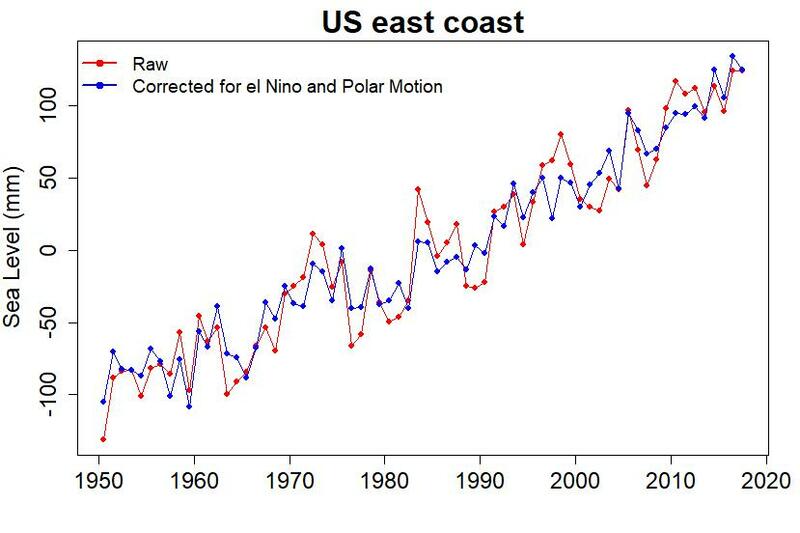 That doesn’t mean your model is right, but it does mean the trend isn’t at constant rate. Example: fit a quadratic. Test the quadratic term (usually a t-test from most computer programs). 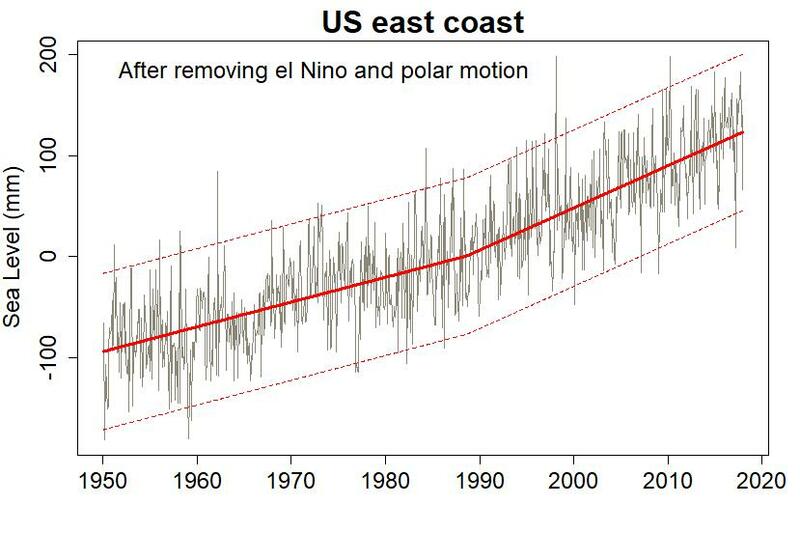 Significant ==> not just linear == trend rate change. It doesn’t mean necessarily quadratic, it does mean not constant. If the model involves a discontinuity (step change, or change point for slope) then the stats are very complex and I advise evaluating significance by Monte Carlo simulations.